Gary Barwin, my neighbour here in Hamilton, has written "some of the freshest and most whimsical English ever contained between covers" in his new novel Yiddish for Pirates, the Globe and Mail's reviewer enthused; it's "a language-lover's dream come true." For my Bar Mitzvah, a family friend gave me a little manual Olivetti typewriter. I was an intense kid and I loved that typewriter, its minimalist mod mid-70s Italian simplicity, its intimate voice, its ability to make me feel like I was at the centre, looking out. I used to carry it into the woods, set it up on a stump and write. I would take it to the food court at the mall and imagine all the other places where I could go with it and how—between the typewriter and me—we’d absorb the world around us—its energies, sights, sounds, moods—and write it down. Or, there in the middle of the world, playing its keyboard like an instrument, the typewriter and I would find or construct what we thought or felt through the medium of words and tell it to the world. But, I can hear you say, we have exactly that now, it’s called Facebook, and we sit everywhere with our laptops and share cat videos and celebrity death notices. Sure, that’s true, and I do spend a lot of time on Facebook, so much so that I’d have to say that it, too, is one of the places where I write. A lot of my Facebook time is spent with my community of friends, colleagues and random others, just hanging out, talking about things and making wisecracks (“There’s a wisecrack in everything, that’s how the light gets in”) and generally avoiding applying myself directly. However, in addition to the company, witticisms, shared articles, writing, other links, and just the general knowledge, thoughts, and insights of my online friends, it is often very directly helpful to my writing. Just today, I was chatting to the writer Adam Pottle about his novella The Bus (coming out this fall with Quattro) about disabilities and the Nazis (his book addresses this) and he sent me some very useful research sources for my novel-in-progress that involves a circus which hides those persecuted by the Nazis, including those with disabilities. But, look! Facebook-like, I’ve got myself distracted here. The point I mean to make is that the location of my writing is permeable and changeable. I may be at my desk, but I’m connected to the outside world. At many times, I value the surprise interruption or eruption of new material. Sometimes it breaks open my way of thinking by sending me an unexpected connection or insight. Of course, sometimes, I’m just getting sidetracked or goofing off. But I do try to harness the energy of procrastination and take the energy of avoiding working on one project to fuel another. I’ve accidentally ended up with whole collections of poems when I’m “supposed” to be writing an article or some fiction. It’s also true that much of my thinking about writing takes place on walks in the woods of Hamilton or during night walks with my dog (frequently to the Chedoke Golf Club, through the woods to McMaster University or to Kay Drage Park) or while kayaking in Cootes Paradise. Also when I’m trying to sleep at night. I think of writing as conniving with both routine and mood in order to create or focus energy. At home, there are two “officially” designated places where I write. This desk is downstairs and in an effort not to slouch and continue to have the posture of the wizened lovechild of an old baseball glove and a witch, I’ve started using a second monitor perched on some inspiringly thick and obsolete left-over technology that I had hanging around the house: two dictionaries. This way, I’m not all shoegaze, but instead look up—often past my monitor and at the birds and squirrels on my porch, or the school kids sharing pizza or the university students looking for free parking in front of my house. I’ve also started using an exercise ball to sit on, but, I confess, I don’t always use it. Sometimes, I’m a big crooked fetus crouched on a chair, curled up and picking at the keyboard with twisty crone fingers while sucking on a large mug of large coffee, attempting to jump-start my brain. And cackling. 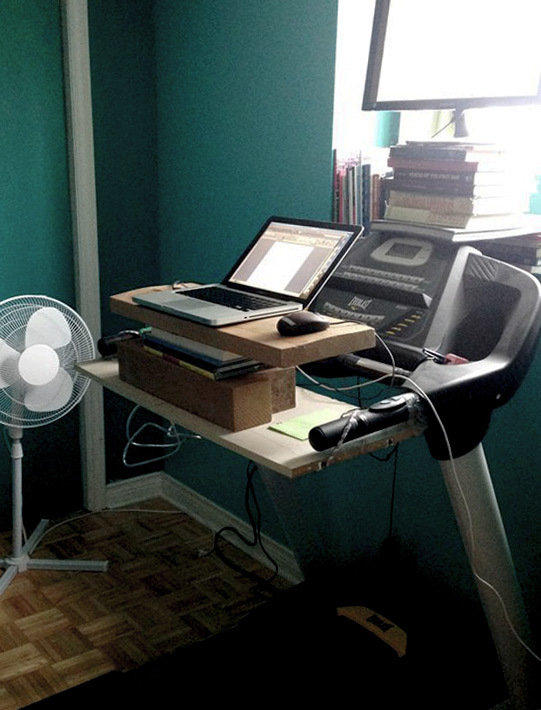 The other place I write at home—and I wrote most of my novel Yiddish for Pirates there—is on a treadmill jerry-rigged into a walking desk. There is a thrill of endorphins being released when I step on the treadmill (like the phantom caffeine rush when I pour a coffee, before I’ve even sipped at it) and certainly the feeling of steady walking over a few hours feels good and stimulates thought. And I can’t slouch. I figure, that at the end of a writing session, even if I’ve not written anything decent, at least I’ve got in some exercise (and avoided forgetting to walk and ending up splatted against the wall.) But walking keeps me writing. The steady pace encourages a steady flow of typing and thinking and tends to drive away the petrification that happens when I’m sitting at my desk. After several hours of walking, I tend to drift to a different place in the house (the kitchen, the dining room, the backyard under a tree) or walk the few minutes into Westdale to a coffee shop such as My Dog Joe. A change of place re-energizes me. For this reason, sometimes, after I drive my wife to work, I stop somewhere to write. For instance, I enjoy going to Williams’ Coffee Pub down by the Hamilton Waterfront. There are sailboats, people skating, biking, walking and a general happy buzz of people being active inside or out of doors. There’s an app one can get of a variety of coffee shop sounds if one likes this ambience, but I tend to prefer the real thing. (Maybe there’s an app of applause sounds. It’d great to have that at the end of each sentence. Contrarily, I admit that, after hearing Helen Oyeyemi talk about it, I bought the Write-or-Die app that starts to erase your text if you stop for more than a minute. I haven’t used it yet, but I know it’s there, waiting. A warning about what will happen if I’m not productive. Finally, I would say, hearkening back to my little Olivetti, that the little window of my computer is really where most of my actual writing takes place, regardless of where I am. And typing is an integral part of it. I conceive of it like playing an instrument. When I pick up a saxophone, I think, ok, now what, what possibilities does this instrument suggest to me? And then, once the first note sounds, I think, all right, what happens next, what kind of thing might follow this particular note? And so on, until, note by note, I have music, a rhythm, a solo, a melody, a raucous squinching, a delicate quailing, a skronking song. It’s a play of improvisation, listening and getting sensory pleasure from the medium itself and the pleasure I get from the process. That’s writing for me, wherever I am.